The house is all decorated and now it’s time to just sit back and soak up the holiday season! …it’s all just so fun! Although, I do have to admit that I am a teensy stressed, as I haven’t even completed 5% of my shopping. Time is just scooting by so fast, and I need to get organized! But for now, I will pour myself a Bailey’s on ice and sit back and enjoy my holiday home! 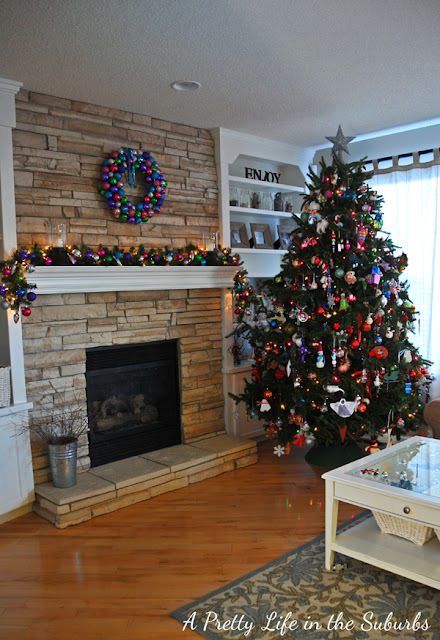 Ever year we buy a real tree – we love the smell and everything about having a real tree. The needles and the mess never bother me…it’s all just part of the charm of the season! And we always try to buy a big tree – at least 7-8 feet…so it always takes up a huge chunk of our living space! 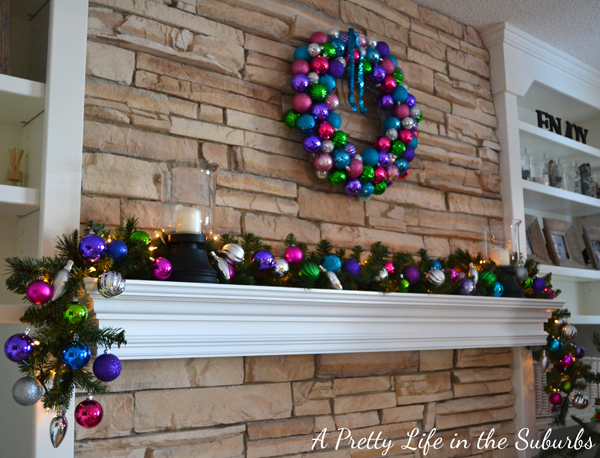 Because our tree is such a focal point in this space I try to keep the mantel very simple. I could do so much more with it, but it would just get lost next to the tree. So all I have done is add an evergreen garland with white lights, and hung the same ornaments that are also found on my staircase garlands and on my wreath. This year I did add a new wreath. I think it added just the perfect finishing touch! It ties together the mantel, the tree and the garlands on my staircase. I wouldn’t say I have a theme yet, but it works for me. This is our tree! 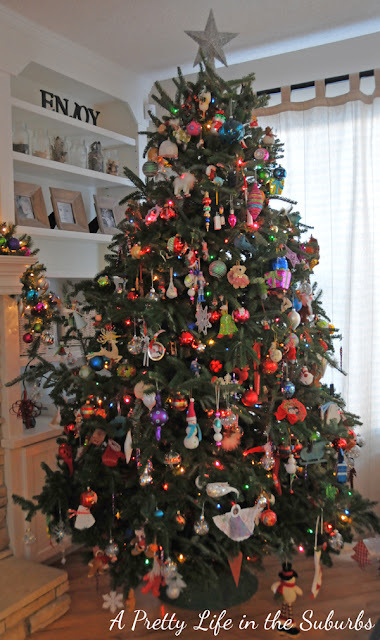 So pretty, and SO full of ornaments! …they were all bought for each other over the seasons, and they are cherished and adored. It fell into our coffee table, and smashed. Smashed. Ornaments everywhere. One other space I love to decorate is my coffee table. I change it up for each season! Here are my staircase garlands. I just wrapped them in evergreen garlands and white lights, and hung a tonne of ornaments! 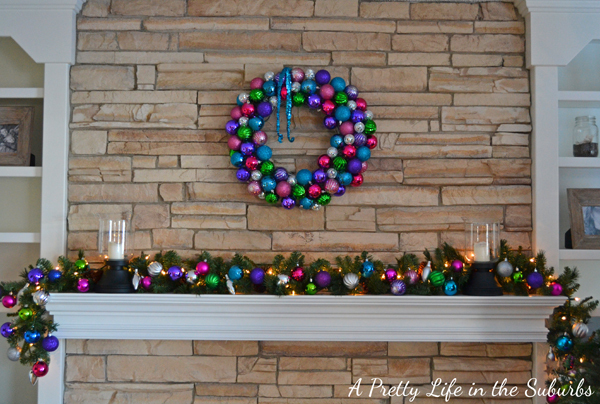 All of the ball ornaments are shatterproof – not a glass ornament in sight! And this is a must for our house! Every time, and I mean every time, someone goes up or down the stairs, at least one or two of these balls goes bouncing across the floor. Even as I write this I can see 3 ornaments on the floor. Can you imagine if they were glass?! Shudder. The staircase looks so so sparkly and pretty at night! How is your holiday home decorating coming? Gorgeous and fun …terrific work!! I love your Christmas decorations. They are so bright and cheery. So pretty! I LOVE your coffee table! So so pretty! I love your bright and sparkly colours and how everything flows. Your coffee table is divine! Color color color I love it! yes yes yes, love the color here so vibrant and pretty. Wow Jo-Anna! It is beautiful! We can’t wait to see it in real life! How about New Year’s? You free? Your home is so bright and beautiful! Your garland is so full! I just love it! I love the deep colors and your decor goes together so well! I am working on getting everything to tie together. Happy Christmas! Everything looks gorgeous! I am so attempting that wreath. I just adore it! 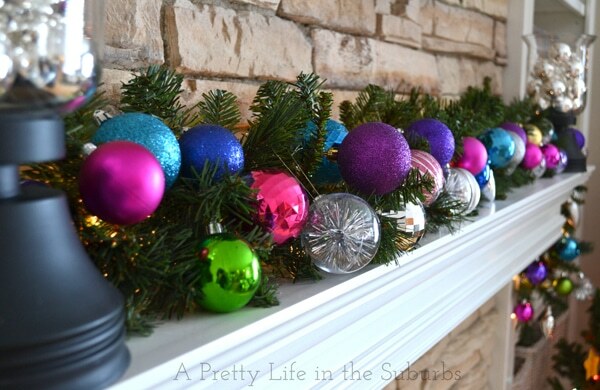 Love the color, your home and mantel are just gorgeous! fun and cheery! Adorable decorations. What an amazing job you did!! LOVE it all! Love all your decor. Looks awesome! Love all your decor! It’s so bright and festive! I’m wanting to use the jewel tones next year. Think I’ll hit up Target the day after Christmas. I love your festive color palette! It’s very, very pretty. I LOVE THAT YOU KEEP WITH THE SAME COLOR THEME. Your home looks SO cheerful!!! I love your colorful ornaments and your stairs look so fun and joyful – I’m imagining everyone coming down Christmas morning all excited!! 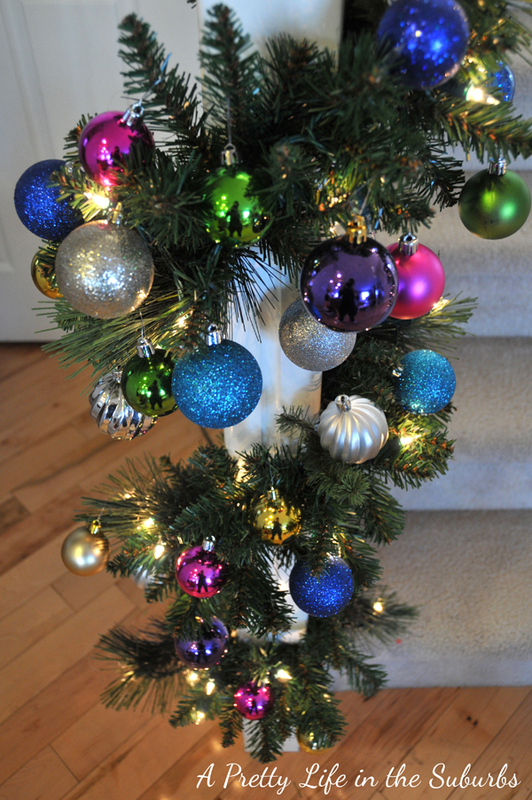 Love all of the colorful, sparkly ornaments! 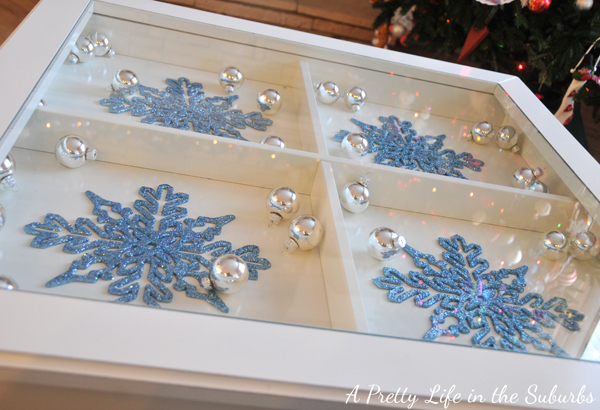 Lots of holiday cheer : ) Thanks for linking up! Gorgeous! Love all those ornaments! !Terrific job. I love your tree & that wreath is so pretty. I really, really love the color scheme. So cheery and bright! Your tree is fantastic! So sorry you lost some treasured ornaments. Beautiful decorations. I love how the colors just pop at you. Omgoodness! My tree has fallen before years ago I cried too! I was soooo sad! Just glad It didn’t injure anyone! Love the the decor! So beautiful Jo-Anna! 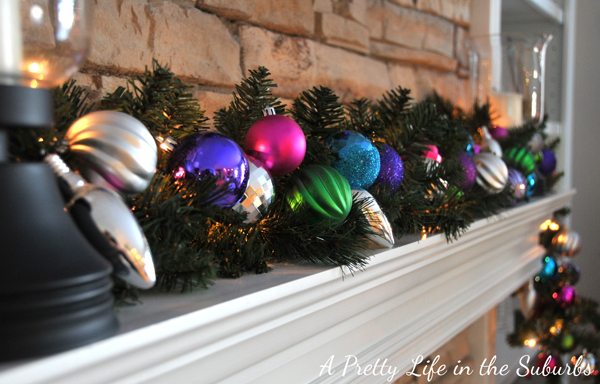 I love your colorful tree & mantel! Love how the colors pop against the neutrals of the house. So fun! Visiting from The Nester’s tour – Merry Christmas! I’m so sorry to hear that your tree fell. BUT! 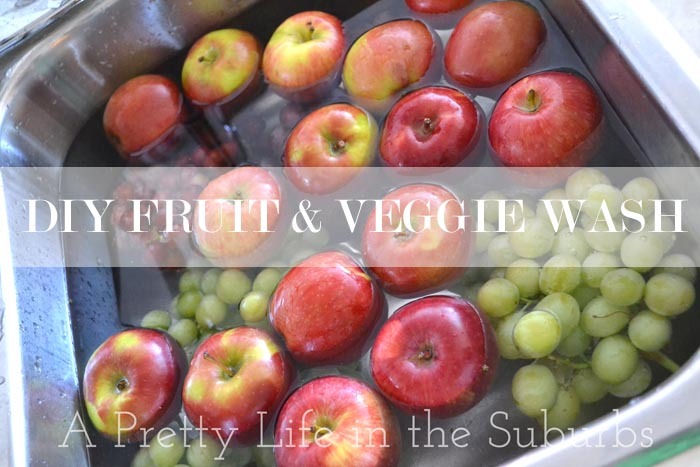 Your home is beautiful and I adore all the color! 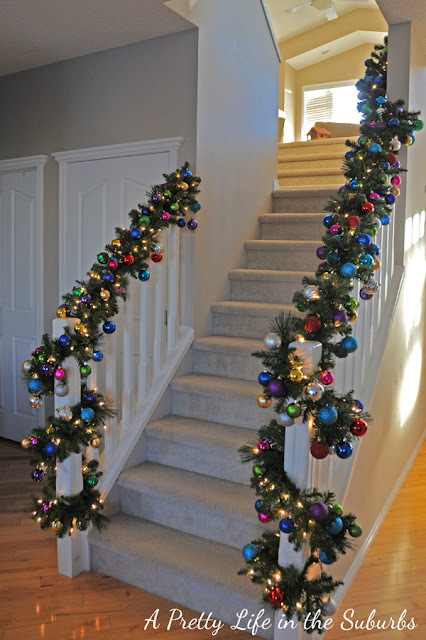 Those stair garlands are amazing! Love your tree. Looks like a family effort!